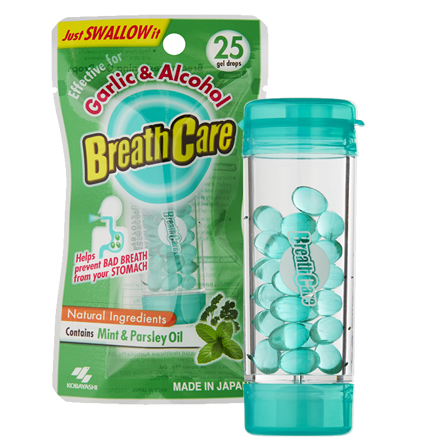 Breathcare are freshening gel drops that help prevent bad breath. The strong odour from foods such as garlic, onions and fish continue while they are being digested in your stomach. 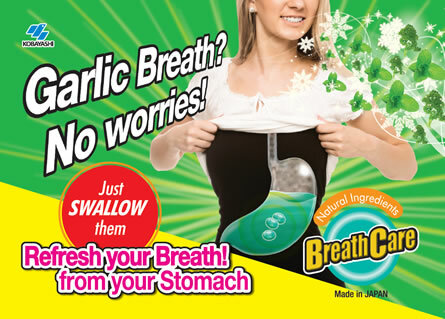 Breathcare helps refresh your breath from inside your stomach, reducing these strong odours. Breathcare drops are made with natural herbs including mint and parsley, used to assist with digestion and counter strong food odours. These drops are a convenient way to add these herbal ingredients to your meals. The gel drops are swallowed with water, ensuring fresh breath starts all the way down in the stomach and not just in the mouth.